This morning, Palmeiras signed centre-back André Luiz, elevating coach Kleina’s number of available options in the segment to seven. André Luiz spent the last eight years in Europe, forming the defensive backbone of Nancy/FRA, at times as captain of the team. 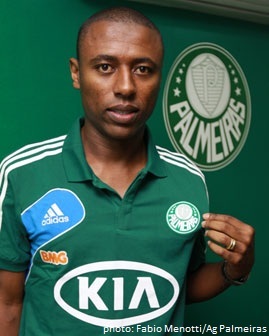 The 33-year-old comes at no cost for Palmeiras, the player having already terminated his contract with the French club. André Luiz’s new contract is valid until the end of the year and subject to renewal, if Palmeiras so wish. Originating from Cruzeiro’s youth academy, the 185 centimetre tall defender drew the attention of Nancy’s scouts during his years at Atlético Mineiro 2003-2005. His transfer happened the same year Nancy won the French Cup: as it turnes out André Luiz’s only title so far in his career. André Luiz’s signing came as a surprise, which is a good thing in itself: palmeirenses are used to previous director’s sloppy (or lack of) procedures, where every negotiation was known in advance, then turned into a novella, before generally leading nowhere. As became evident with Kleber – recently arrived from Porto/POR – football executive Brunoro knows how to hide his game well. Welcome, André Luiz, and good luck.